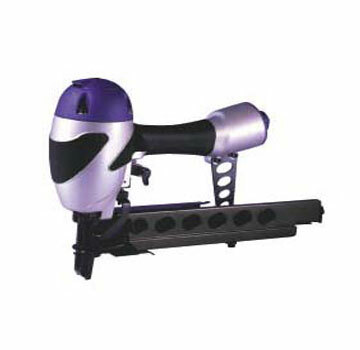 PRODUCT: Spotnails MS6650i Heavy Duty Grade, 16-Gauge Medium Crown Air Stapler Kit. Uses industry standard Senco / Spotnails / Duofast type 7/16 inch Crown Staples. Price/Kit. * Must ship to billing address. * Credit Card Holder must have photo ID and Sign for tool. Fastener Length Range: 3/4" to 2"
N-11 STAPLE (Senco type). 3/4 INCH LEG x 7/16 MEDIUM CROWN, 16 GAUGE GALVANIZED STEEL, CHISEL POINT. 10,000/BOX. PRICE/BOX. N-13 Staple, Senco Type, 1 LEG x 7/16 INCH MEDIUM CROWN, 16 GAUGE GALVANIZED, Box of 10,000. Price/Box. N-15 Staple, 1-1/4 Long x 7/16 Medium Crown (Senco Type) 16 Gauge Galvanized Steel Staple, Box of 10,000. Price/Box. N-17 Stainless Steel Medium Crown Staples. 1-1/2 inch Leg, 7/16 Crown, 16 Gauge 304 Stainless Steel, Chisel Point. 10,000/Box. Price/Box. N-17 Staple, 1-1/2 Leg x 7/16 Medium Crown Senco type, Heavy Duty 16 Gauge Galvanized, Chisel Point. 10,000/Box. Price/Box. N-19 Staples, Senco type, 1-3/4 Leg x 7/16 Inch Medium Crown, 16 Gauge Galvanized. 10,000/BOX. PRICE/BOX. N-21 Staple,2-Inch LEG x 7/16 Medium Crown (Senco Type) N-Wire 16 Gauge, Electro-Galvanized Finish. 10,000/Box. Price/Box.